2011 Kenya Basketball Premier League Most Valuable Player (MVP) Samba Mjomba is not your ordinary lady. Right from her high school days she was destined to make it big on the basketball court and she made sure she surpasses all obstacles and hindrances on her way; who could blame her, this is what she wanted. Born on 30th August 1985 in Nairobi, Mjomba started playing basketball in Form One at Moi Girls High School, Nairobi after trying out her stint in primary school, St. Georges Primary in Nairobi. Born and raised in Nairobi in a family of six (five girls, one boy), the third born decided to join the Moi Girls High School Basketball Team in early 2000. Since then she hasn’t looked back. “Basketball is like part of my life. I remember in 2000 I decided to join my former high school’s team. I got a cordial welcome after school trials and for me that was a big step. It’s then I put in mind that I can go professional from there,” she told Michezoafrika.com. Mjomba took her education seriously too and after her KCSE she joined USIU and graduated with a Degree in Bachelor of Arts (International Relations) in 2010.It was during this time that she joined USIU basketball team, the USIU Flames. “Remember I had decided to go pro in this game so I wasn’t going to stop after high school. I joined the USIU Flames,” added the flamboyant and ever smiling lady. 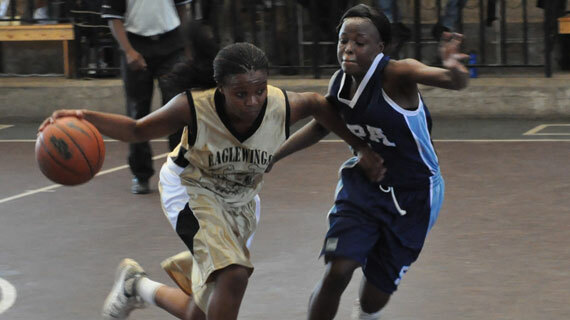 Mjomba then joined Champions Eagle Wings after finishing up with her studies and featured in the team that won the Basketball Championship in 2011. During this season, she was the top scorer with 22 points in one of the matches. She has also been in the national team ever since 2006 when she completed her high school studies. Her career was on the rise when she was named the Most Valuable Player in 2011 after a successful season that saw her team win the championship. This was also her first championship title as a professional player. She was on cloud nine when in 2008 she was named the assistant captain to the National team and also the captain to USIU Flames in the same year. This was the year that her university team was representing the country in the East and Central Africa Championships in Ethiopia. Her team came in third. Consecutively, her team took part in the All Africa Championship in which they came in 6th. On to her lows and forget-quicks, Mjomba was at her lowest when her team missed out the Tunisia hosted Club Championships in 2010. “I can’t tell you right how bad I felt when Eagle Wings didn’t make it to the Club Championships in 2010,” said the court queen. “One of the problems that came about was sponsorship. It was so sad for me and my team mates”, she adds. Revealing her model and motivator, Samba gave all the credits to her Father Mr. Elias Mwakamba Mjomba. “I don’t think there’s anyone who fits in the shoes of my dad. His motivation, his dedication and support when it comes to my basketball career; no one will ever match that,” she says. Her professional role model on the court is Kobe Bryant of LA Lakers and Michael Jordan, retired from Chicago Bulls. Off the pitch, Mjomba wants to pursue a Masters in the next two years. She also dreams of starting up an NGO whereby she will be able to support the less privileged kids, on and off the basketball court and also to give back to the community. Professionally she wants to make basketball a household name where it will be popular just like soccer is. “Always put God first in all you do. When you do that be sure He will be with you every step of the way and He’s to make sure basketball will be of help to you both on and off the court.” She said.